Antique Patchwork Quilt~60+ years old. 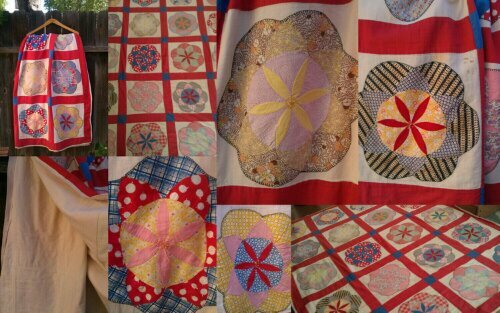 Antique Patchwork Quilt in a Flower pattern with squares. The flowers sort of look like daisies. VERY old. I think it may be from the 40s or 50s. In wonderful condition for its age. It does have some stains, a few on the front and some on the back by the hem. I have not washed it because I have not taken care of an older quilt like this. I will leave that for the buyer to decide. There are some broken stitches on the flowers. Can be fixed with some hand stitches. One flower with such damage is shown in pics. Super pretty piece. Would make a wonderful bedspread or could be used as a wall handing because the pattern is so pretty. Dimensions: 63″ wide, 77″ long. Comments Off on Antique Patchwork Quilt~60+ years old.